This coffee table brings more than just rustic style to your living room. With both big and small drawers, this table keeps TV remotes or coasters easy to find and separate from clunky items, such as video game controllers. Additionally, this coffee table's flip top provides an excellent place to store extra blankets for rainy day movie marathons. The Dundee Rustic Coffee Table with Flip Top Storage by Sunny Designs at Furniture Mart Colorado in the Denver, Northern Colorado, Fort Morgan, Sterling, CO area. Product availability may vary. Contact us for the most current availability on this product. The sturdy farmhouse design of these pieces brings the rustic style of this collection into focus. With a deep Kettle Black finish, these pieces help to enrich the vibrance of your home's personal style and color scheme. Among the rustic style of this collection, details such as felt bottom drawers bring modern practicality and functionality to these pieces. 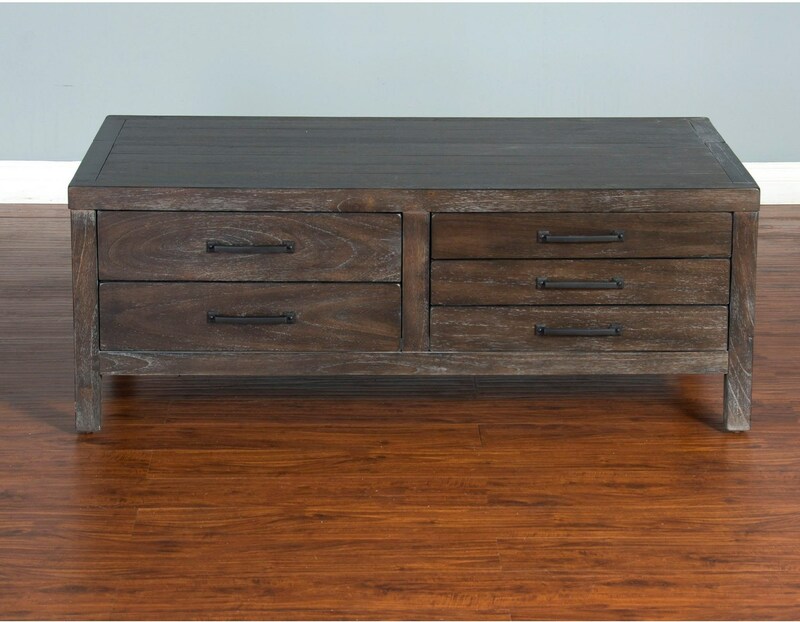 The Dundee collection is a great option if you are looking for Rustic furniture in the Denver, Northern Colorado, Fort Morgan, Sterling, CO area. Browse other items in the Dundee collection from Furniture Mart Colorado in the Denver, Northern Colorado, Fort Morgan, Sterling, CO area.